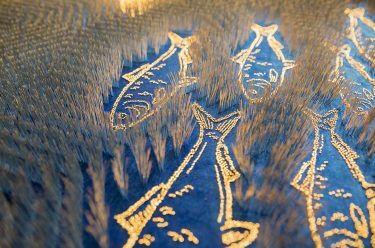 Pakistani artist Aisha Khalid’s site-specific triptych Water has never feared the fire is a set of hanging textiles embedded with millions of long, steel and gold-plated pins commissioned for ‘The 9th Asia Pacific Triennial of Contemporary Art’ (APT9). This remarkable sculptural textile presented unique unpacking and documenting challenges upon its arrival at the Gallery. Emily Gray takes us behind-the-scenes as the Gallery prepared the delicate but prickly work for display. Khalid creates large-scale textile works from fabric and pins, often taking her inspiration from the colours and geometric patterns of Persian visual culture. 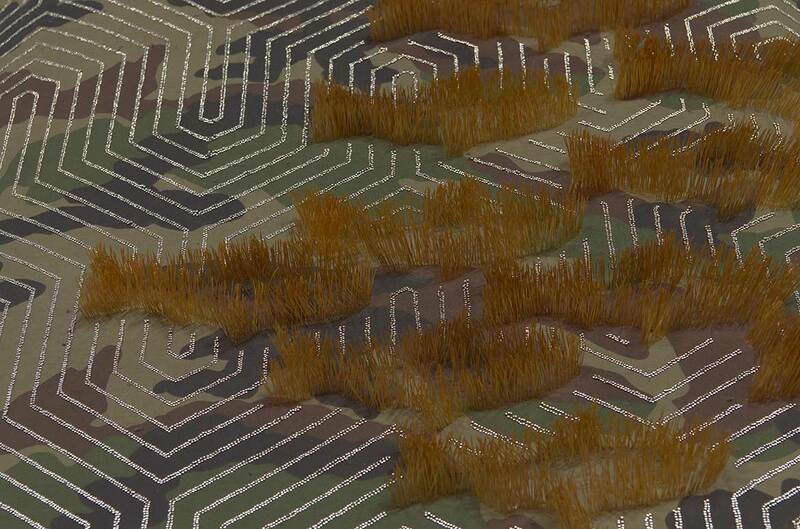 Her works incorporate a number of traditional elements, referencing miniature painting and designs from Charbagh gardens, a quadrilateral garden layout based on the ‘four gardens of paradise’ mentioned in the Qur’an. 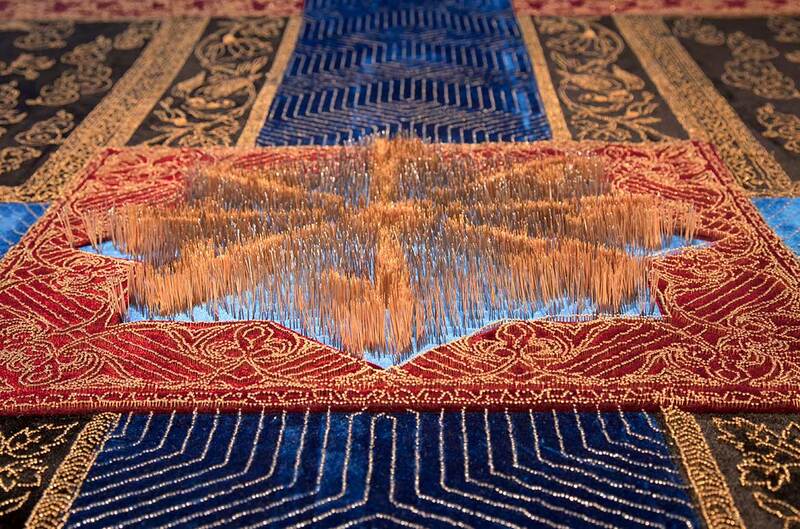 Khalid adds a three-dimensional, sculptural aspect to her works by using sharp pins to pierce through several layers of cloth, leaving the sharp ends exposed. 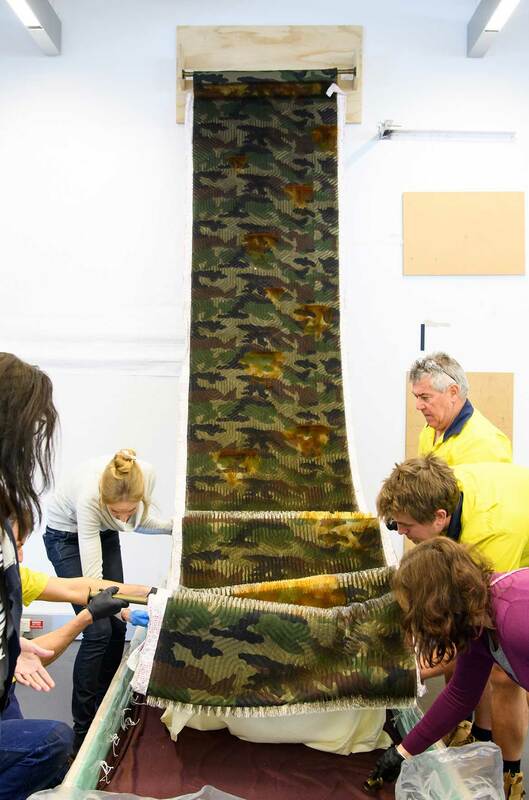 This technique presented unique challenges for staff in unpacking, moving and storing the textiles without displacing any of the pins. Water has never feared the fire was freighted from Lahore, Pakistan in three timber crates. The artist devised a way of packing the textile panels so that they were literally suspended in their crates during transit. Each panel had lengths of cotton fabric machine-sewn to the long edges of the work, together with horizontal metal poles that had been screwed into the sides of the crates to provide additional support and separation between the two layers of fabric and pins. The cotton strips were anchored with string to metal eyelets at multiple points along the inside of the crates. 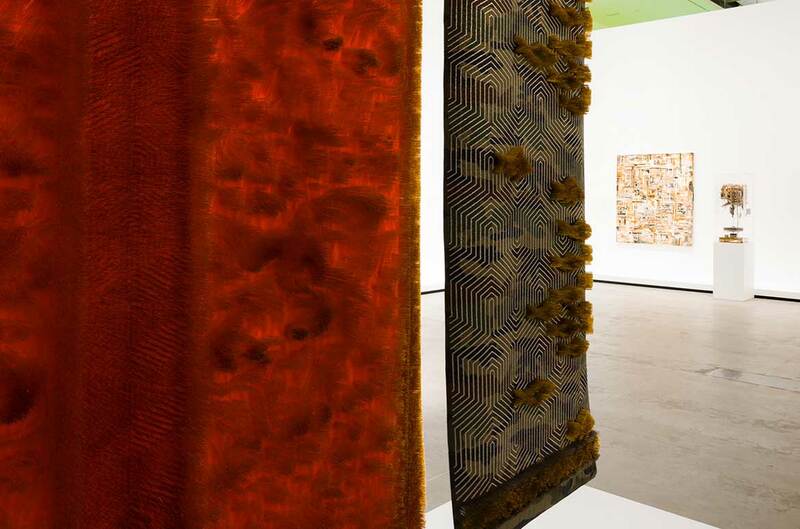 Together, the tapestry’s three panels comprise roughly three million steel and gold-plated steel pins pushed through a strong synthetic velvet and cotton substrate. 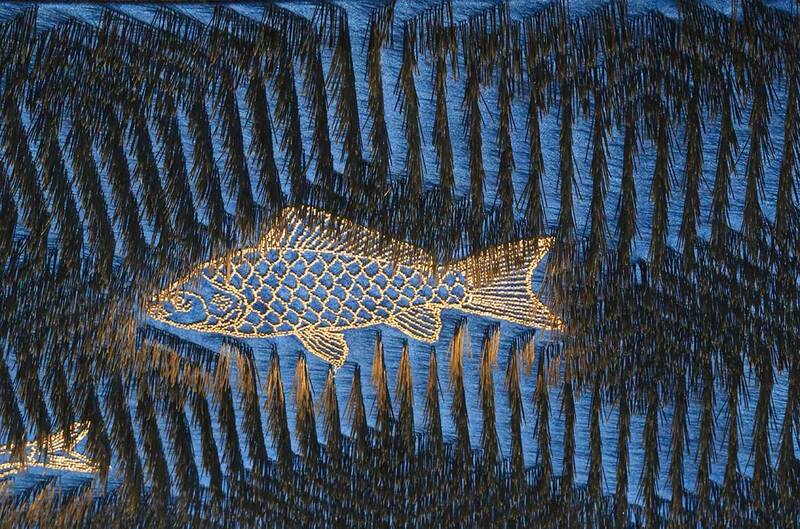 Since the surface of the artwork was quite vulnerable, unpacking and moving the tapestries required careful planning. The panels are also very heavy: the central panel is the largest (485 x 120cm) and weighs almost 100 kilograms, while the left and right panels (485 x 60cm) are approximately 40 kilograms each. We decided to unpack one of the smaller textiles first — this had pins pushed through in only one direction, which meant that the artwork could be laid out on tables if handling became problematic. Workshop staff constructed a hanging bracket fixed to a wall in Conservation. 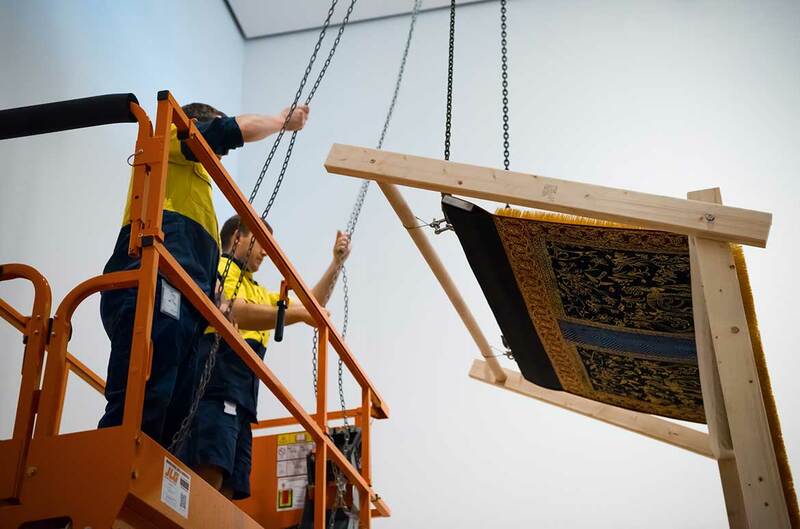 While art handlers supported and lifted the artwork, two staff systematically cut the strings anchoring it in its crate. 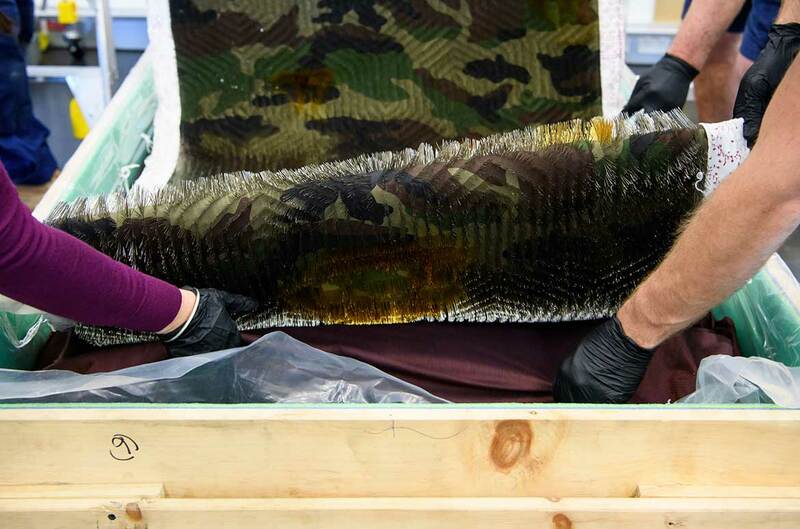 While maintaining tension to the textile, we slowly raised the artwork from a horizontal to a vertical position, leaving the lower section (in fact, the top of the artwork) lying in the crate. Our sculpture conservator was then able to unpick the cotton strips on either side of the panel and remove particulate matter — some polystyrene packing material and small wood splinters — from among the pins, a soft paintbrush was used to remove the debris, grabbing the unwanted particulate without disturbing the pins. In the meantime, a frame was constructed suitable for storing the textile and moving the work into the exhibition space. The final design solution was a large timber-framed vertical rack on wheels; the textile is wrapped around the fabric-covered rolls at the top and bottom. Positioning the two double-sided pinned textiles on their timber frames required thoughtful planning to ensure that none of the pins were crushed. 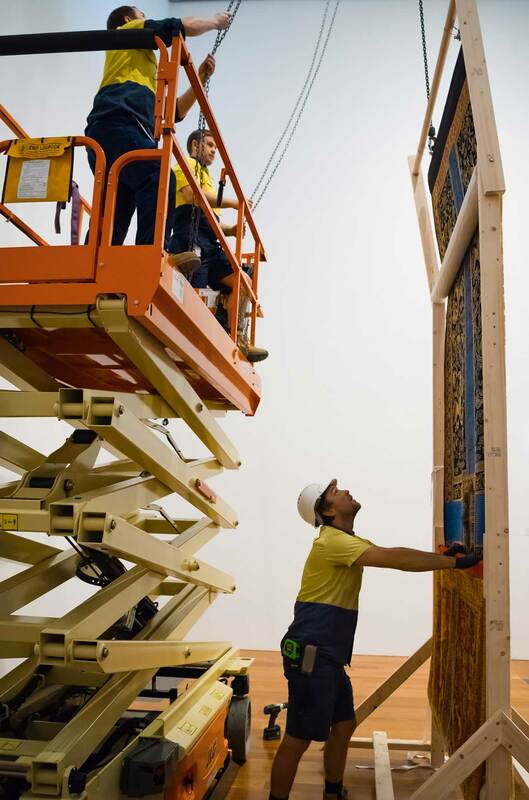 A team of six people was involved in raising the artwork into position using a chain and pulley system and a mount secured to the gallery ceiling. Finally, the bottom edge of the work was carefully fed under the lower roll of the storage system. While the artwork is on display in ‘The 9th Asia Pacific Triennial of Contemporary Art‘ (APT9) Registration staff will agree on a long-term storage solution with Workshop and Conservation staff to ensure that the finished product is space-efficient and suitably fitted out — essentially three crates will be constructed for this light-sensitive and difficult-to-clean artwork. A practising photographer since the 1970s, Anne Noble creates bodies of work through what she refers to as ‘essays’ or ‘narratives’ of photographic images. 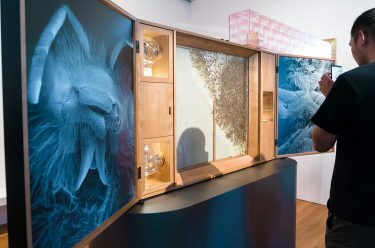 For APT9, Noble has created a multi-part project at the heart of which is Conversatio: A cabinet of wonder, a functioning beehive or ‘living photograph’. Watch our video to hear Anne passionately describe the inspiration for her work – the notion of a future without bees and what that would mean. Subscribe to our QAGOMA YouTube channel to keep up-to-date with our latest videos and hear more from our exhibiting artists. Bees can be observed entering GOMA, before disappearing inside the cabinet and going about their normal activities; they are also visible when the cabinet is opened daily for 20 minutes at 11.45am, 12.45pm, 2.45pm and 3.45pm. 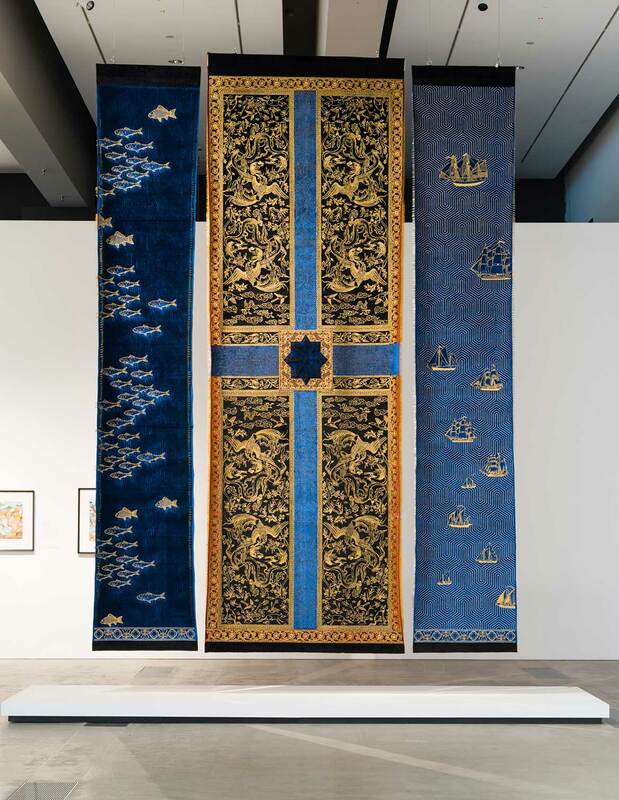 Read more about Aisha Khalid and Anne Noble in The 9th Asia Pacific Triennial of Contemporary Art available online or in store. The publication represents an important and lasting document of the current artistic landscape of Australia, Asia and the Pacific. A most interesting installation. Enjoyed the huge range of art on display and the intersting behind the scenes in this production.